Reliable and affordable domestic cleaning services in Hanwell W7 performed by professionally trained cleaners from First Class Cleaner. Get a free and non-obligatory quote now! You are probably tired from the never ending domestic cleaning which you are obliged to perform in your home every week and that is perfectly alright. Our professional cleaning company is capable to take that responsibility from your full schedule and give you more time for relaxation. We have the skills to battle the grime in all kinds of properties from every district of London. You don’t have to put your social life on hold every time your home is dirty because it is enough just to reserve our productive domestic cleaning and we will come to take care of the problematic spaces. 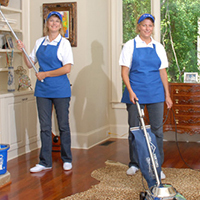 To make sure that the place you are currently living in is in top shape and without a trace of dangerous microbes, take advantage of our top of the line domestic cleaning services and you will be very happy. Our home sanitation contains disinfecting treatments of all types which will be applied to every space in your property, in order to be erased all grime and dust. Our professional cleaning company has an office in the city of London and there you are more than welcome to reserve the useful domestic cleaning we are offering you. The whole process will take only a couple of minutes from your day and a very little amount of money from your bank account. For the sanitation itself will take care our ambitious professional cleaners who will be at your services during the whole day of the performance of the domestic cleaning in your real estate property. Contact us now and make the preparations for the positive transformation of your home today.